Google wants to make the web more secure and has been encouraging us to secure our sites with HTTPS. To further incentivize SEOs, Google announced that HTTPS is a ranking signal that can give your site a small ranking benefit. 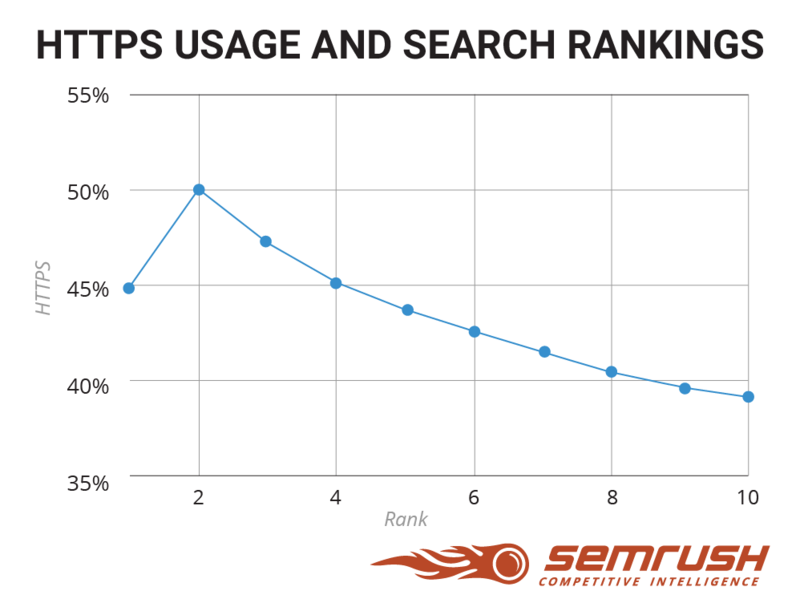 Despite the potential SEO benefits, the majority of sites aren’t migrating to HTTPS, according to a study by SEMrush (disclosure: I work for SEMrush). Our team analyzed the popularity of HTTPS over the past few years and discovered the HTTPS usage trend in different industries and among the top global companies. This study follows on statistics Google provided last year on the use of HTTPS on popular websites, which were chosen based on Google’s own internal data and publicly available Alexa data. Findings showed that these websites accounted for approximately 25 percent of all website traffic on the Internet. Also, according to Statoperator, as of June 2016, 10.2 percent of Alexa top 1 million websites used HTTPS by default. Let’s dig into the latest results. 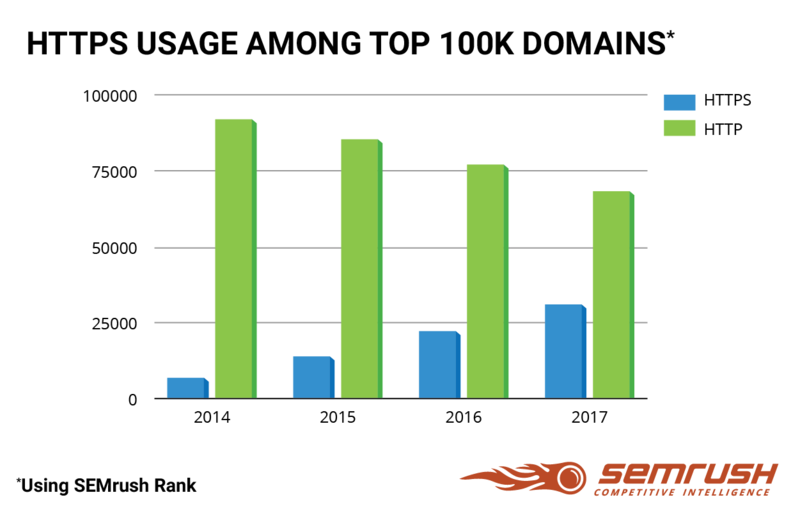 By scrutinizing the top 100,000 domains (according to SEMrush Rank’s U.S. database), the SEMrush team discovered that HTTPS usage has tripled among these sites between 2014 and 2017. Over the past three years, the percentage of these sites that are marked with a green padlock on your browser’s address bar has increased from 7.6 percent to 31.5 percent. That means 31,549 out of 100,000 are now using HTTPS. 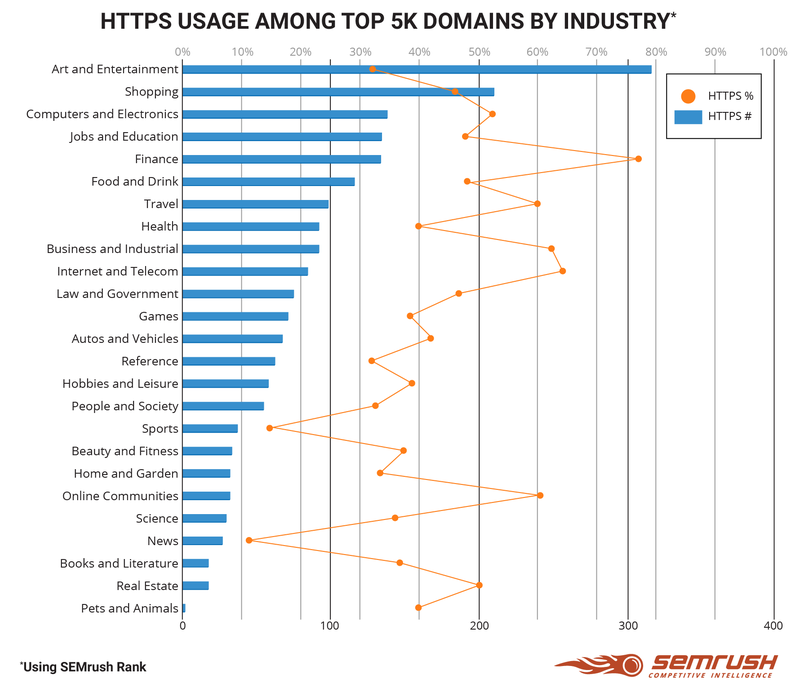 The next part of the study was to determine how many of the top 5,000 domains divided into 25 industries (according to SEMrush Rank) are using HTTPS. SEMrush found out that 41 percent of these sites were using HTTPS in 2017. When it comes to industries, 316 of Arts & Entertainment websites used HTTPS, which made this category the industry with the highest number of sites secured with HTTPS. The three industries with the highest percentage of HTTPS usage were Finance (77 percent), Internet & Telecom (63.91 [percent), and Business & Industrial (62 percent). As for non-HTTPS websites, according to the findings, the industries with the lowest percentages of HTTPS were News (11.25 percent) and Sports (15.95 percent). For the purpose of this research, SEMrush also analyzed the largest U.S. corporations to find out how many of the top global businesses have already moved to HTTPS. 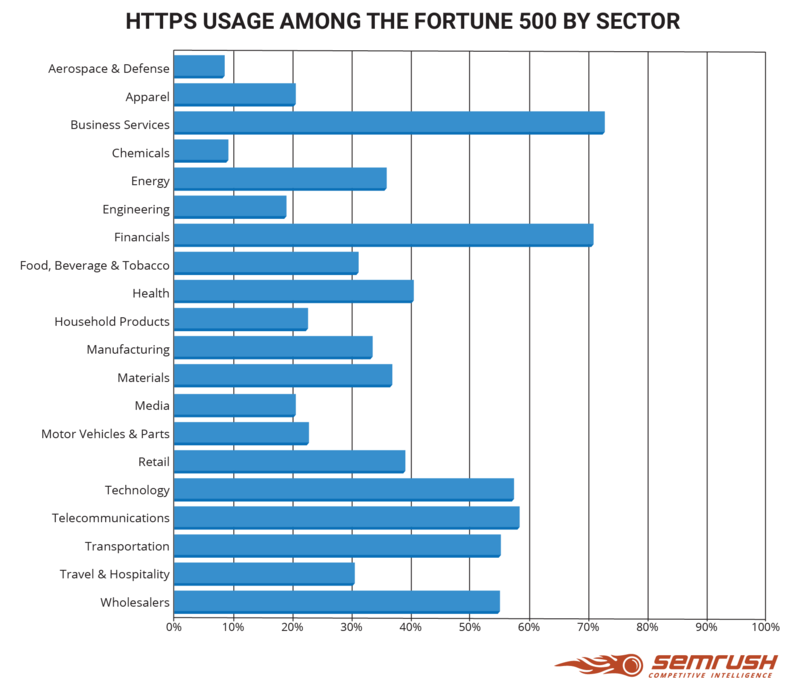 By exploring companies in the Fortune 500 list, the team discovered an interesting HTTPS usage trend. Companies with the highest percentage of HTTPS usage were in the Financial (70 percent) and Business Services (74 percent) sectors. On the other hand, the companies with the lowest percentage of HTTPS usage were in the Aerospace & Defense and Chemicals industries, with 8 percent and 9 percent of HTTPS websites, respectively. To check for any correlation between SERP positions and HTTPS usage, our team sampled 100,000 random keywords. Nearly 45 percent of results in the first position and nearly 50 percent of results in the second position were secured with HTTPS, according to the data. The difference between the first and the second position can be explained by the influence of other more important ranking factors on the top result on the SERP. Although the first position had a lower percentage of HTTPS sites than the second and third positions, the analysis showed an interesting trend on the rest of the first page. The number of sites on the first page that were using HTTPS was steadily decreasing from positions 2 through 10. These findings as a whole supported the idea that HTTPS usage can influence website rankings on Google. What Does HTTPS Actually Do? Hyper Text Transfer Protocol Secure (HTTPS) is the secure version of HTTP, the standard protocol used for communication over the Internet. Development of the Hypertext Transfer Protocol (HTTP) was initiated by Tim Berners-Lee, a British computer scientist and the inventor of the World Wide Web, in as early as 1989. For nearly 18 years, it has been the most popular application protocol used for communication on the Internet. However, communication over HTTP alone isn’t as safe as it used to be. Any unprotected HTTP request can potentially reveal information about users. This information can be intercepted, spied on, and even manipulated by hackers. 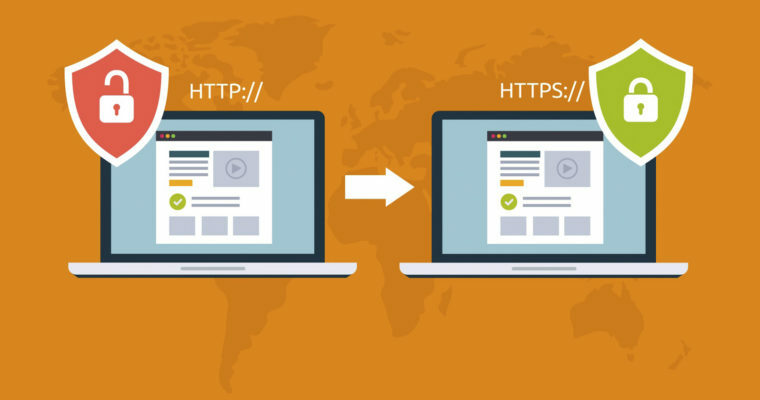 Therefore, an increasing number of websites are now implementing HTTPS, which was developed to protect the integrity and confidentiality of data over the Internet. HTTPS is a form of encryption that keeps site visitors’ information safe. It has been known nearly as long as the World Wide Web itself. Nevertheless, historically, HTTPS connection was primarily used for payment transactions by websites that dealt with money. In the course of time, more websites of various types began to use it, aiming at securing their users’ accounts and keeping their identity and communications private. HTTPS pages use SSL (Secure Sockets Layer) or TLS (Transport Layer Security) protocols to encrypt communications. As a result, servers and clients still communicate with each other using the same HTTP, but over a secure SSL/TLS connection that encrypts their requests and connections. 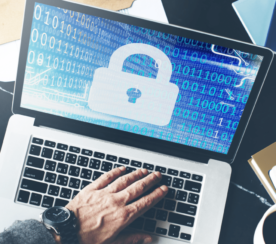 With an HTTPS connection, all communication between a server and a client is securely encrypted, making it more difficult for hackers to intercept, manipulate, or steal information from your server. Switching your site to HTTPS provides you and your site’s visitors with multiple benefits. Here are three. As mentioned previously, the main advantage of HTTPS is that it makes your website more secure for your users. HTTPS is especially important on web pages where users provide their highly sensitive information (e.g., card information and other personal details). When visitors are interacting with your site, they expect a secure and private online experience. Imagine that a user lands on your site and then sees a security warning message from Google. In fact, if a server pretends to be on HTTPS, but its certificate doesn’t match, then most browsers will display a warning behavior. In this scenario, the user is likely to click the back button because they can’t trust your website. 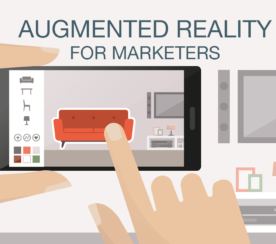 As a result, this can damage your site’s authority and reputation. HTTPS helps your site gain a higher level of trust with your users. Google Analytics becomes even more useful when you move your site to HTTPS. Unlike HTTP, with HTTPS, the security data of the website that referred you is saved. Anna Crowe points out that when traffic comes to your HTTP site, it appears to be “direct” in your analytics report, which isn’t helpful. On the other hand, when traffic comes through your HTTPS site, your referral traffic data is saved. This means you can figure out where your traffic is actually coming from. By now, you should have an idea of whether you should migrate your site to HTTPS. 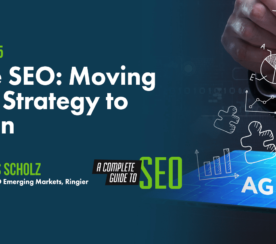 However, one thing is certain: In the fast-evolving SEO world, it’s better to be proactive and keep up with the changes. You can find more facts and data in the full research.